Danish family of engravers, of whom the first important member was Aaron Jacobson (1717-75), who, in the middle of the eighteenth century, left Hamburg and settled in Copenhagen, where (1745) he became engraver of the royal seals. 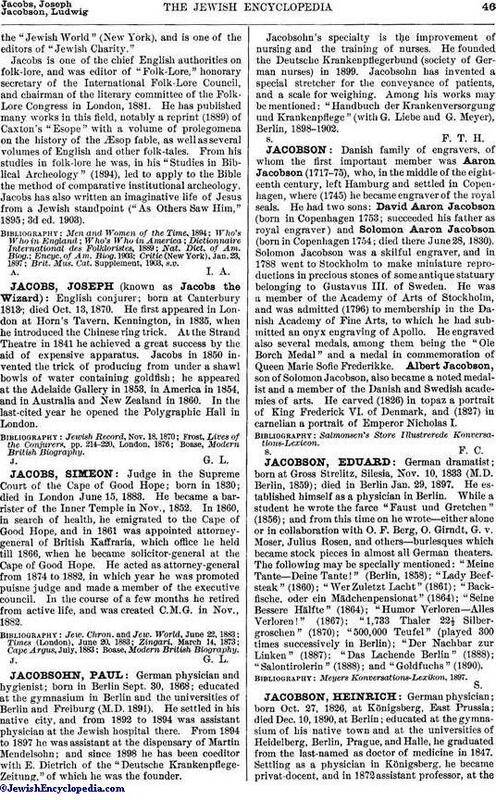 He had two sons: David Aaron Jacobson (born in Copenhagen 1753; succeeded his father as royal engraver) and Solomon Aaron Jacobson (born in Copenhagen 1754; died there June 28, 1830). Solomon Jacobson was a skilful engraver, and in 1788 went to Stockholm to make miniature reproductions in precious stones of some antique statuary belonging to Gustavus III. of Sweden. He was a member of the Academy of Arts of Stockholm, and was admitted (1796) to membership in the Danish Academy of Fine Arts, to which he had submitted an onyx engraving of Apollo. He engraved also several medals, among them being the "Ole Borch Medal" and a medal in commemoration of Queen Marie Sofie Frederikke. Albert Jacobson, son of Solomon Jacobson, also became a noted medalist and a member of the Danish and Swedish academies of arts. He carved (1826) in topaz a portrait of King Frederick VI. of Denmark, and (1827) in carnelian a portrait of Emperor Nicholas I.